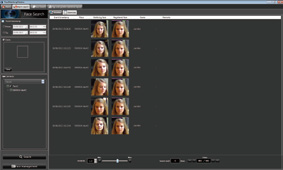 offers the possibility to run facial recognition in an IP Security System. The facial recognition software runs silently in your system, collecting data on each face that it detects;Ai? ?this data is then stored within an easily accessible database. A user will then be able to access this database, and will be given the option to select a particular face. With this functionality, the user can choose to set an alarm to be sounded upon future detection of this subject, or simply track a particular person’s movements in chronological order throughout all of the cameras in the system.